As I am sure many other cachers do, I solve mystery caches, but not that frequently. That is perhaps the reason for the problem that I had. I never seemed to be able to keep track of which mysteries I had solved so every time I was out hunting for caches I would find a “?” on my GPS where I knew I had solved the Mystery but the coordinates and information on the GPS were the oringinal data. I use GSAK extensively but it is installed on three laptops that I use so keeping the information synchronised is difficult. The answer lies in the geocaching.com website itself. This is my way of keeping track of solved mysteries. 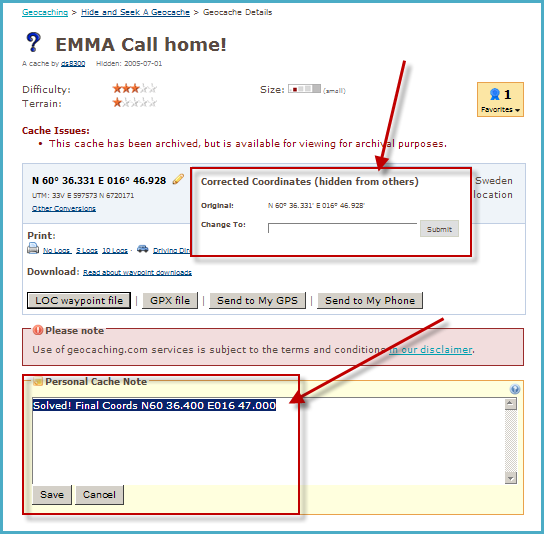 1: Write notes in the Personal Cache Note field. This can include the coordinates for the final location or a description of how the puzzle was solved. 2: Click on the pencil icon next to the published coordinates and enter the coordinates you have determined in the Corrected Coordinates (hidden from others) field. 3: Create a non-shared Bookmark list. 4: Bookmark the puzzle that you have solved. 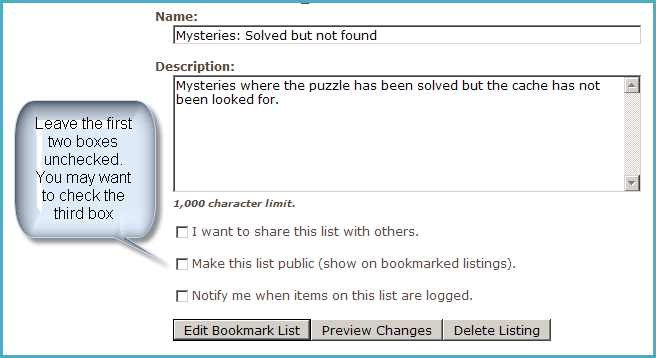 This can then be used either as an online list or to generate a pocket query of your solved but not found mysteries. If you have another way of doing this post a comment. It would be interesting to hear. I prefer to use an indexed, hard-cover notebook so I have a permanent record of all my puzzle/multi final co-ordinates. It lives in my kitbag and offers plenty of space to jot down any other details I want or need to recall about each cache.